WHEN I first saw the trailer for James Cameron's Avatar months ago, I can't say that I was instantaneously hooked, or even intrigued for that matter. When I read about the virgin technology that Cameron used to shape how movies may be produced from hereon in, I wasn't that impressed. And when I noticed that the sci-fi epic was making more money that the GDP of most third world countries, I was still reluctant to sit through the 162-minute film. Then why am I sitting here wondering when I should go see it...again?! That's right people, I'm now a full-fledged endorser of what's got to be collectively the most intriguing, impassioned, and alluring film I've ever seen! Cameron's done it again! But, as is usual in Hollywood, with great success comes contention, controversy, and negative feedback with no real merit. Avatar is surrounded by it, from a skyrocketing budget pegged at as much as half a billion dollars, to claims that the Canadian director portrays Americans as villainous soldiers hellbent on imperialism and capitalism at any expense. Politics, budgets and fellow criticisms aside, Avatar is a force to be reckoned with, an epic of a movie that has garnered comparisons to the crowning jewel of all science fiction motion pictures, Star Wars. "Cameron, who's already proven his knack for storytelling (Titanic), lends us a makeshift look into his synthetic world of glorious rapture..."
Cameron's imaginative and majestic take on a familiar base plot has it set in the distant future (2154) on an alien world (Pandora), something right out of a fantasy film. Oh, wait. Anyways, Pandora is an Earth-like moon that orbits the planet of Polyphemus, and is brimming with something that the RDA mining corporation wants...really bad; a reserve of unobtanium, an extremely rare material that goes for $20 million a kilo back on Earth. To extract the costly & aptly-named mineral RDA has commissioned a small army of ex-marines who'll stop at nothing, including pre-emptive warfare, to get what they want. 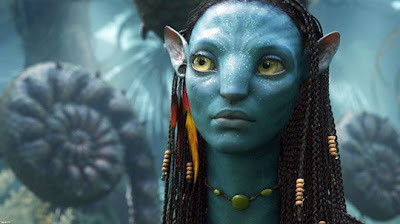 The indigenous creatures that inhabit Pandora, known as the Na'vi, are a prudent species who maintain a neolithic settlement that thrives from the naturalistic energy that is expelled from all living things. The taller (12 feet) & stronger-than-human humanoids have sparkling blue exteriors, feline-like characteristics, and a shared worship for Eywa, their "mother goddess." Because Earthlings are unable to breathe on their own within Pandora's atmosphere, scientists have created genetically-aligned hybrids of both species, called avatars, controlled by their human operators from a device that looks more like a futuristic tanning bed. Dr. Grace Augustine (Sigourney Weaver) runs the RDA's Avatar Program that has recruited a paraplegic ex-marine named Jake Sully, played impeccably by little-known Aussie actor Sam Worthington (Terminator Salvation), who had been living out of his car when he found out Cameron had chosen him to lead this cast of carefully-selected screen talent that also includes Zoe Saldana (Star Trek), Stephen Lang (The Men Who Stare at Goats), Michelle Rodriguez (Girlfight) and Giovanni Ribisi (Public Enemies). Grace & Jake work together to gain the trust and knowledge of the Na'vi people via their avatars, which allows them to navigate naturally on Pandora. As Jake gradually integrates with this alien life he finds himself accepted as one of their own, and has to decide what side he ultimately belongs to. Cameron, who's already proven his knack for onscreen storytelling (Titanic), lends us a makeshift look into his synthetic world of glorious rapture, uninterrupted by our trigger-happy ways. Groundbreaking stereoscopic cameras enhance an experience implausible 15 years earlier, when Cameron had first put Avatar to paper. 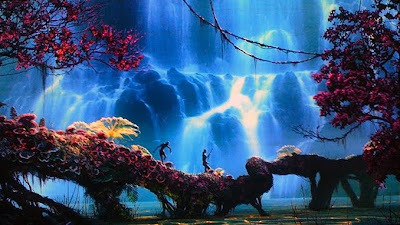 Three-dimensional mountains that hover in the air come to life in an unimaginable background of glowing plantlife, bizarre critters & marvellous creatures, and tranquil trees that harbour the souls of every past Na'vi. You don't ever want to leave this place. In fact, sitting with my 3D glasses on in that cramped third row of the congested movie theatre, with no real desire to embrace this nearly 3-hour global blockbuster, I didn't look down at my watch once! I would've sat there and pissed my pants before missing out on one moment of this momentous occasion of cinematic stimulus. 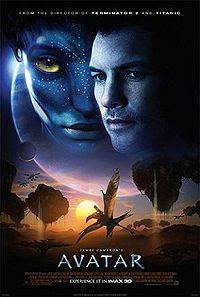 In a sense, Cameron's colossal film, coated by a spirited James Horner score, serves as an avatar itself, using state of the art motion capture technology and profound imagination to take audiences away from their hurried little lives and invite them into this world of euphoric wonderment that erupts real emotions unlike any movie out there. Within its 3-hour span (that includes previews, too), Avatar went from a movie that I didn't even care to see to an experience I'll never forget. That's the magic of moviemaking, a craft that Cameron has mastered without question. Below is the extended trailer for James Cameron's Avatar, courtesy of YouTube.